Death: It's inevitable, and a subject that musicians always come back to, no matter how often they drift to places other than mortality. Whether it's about the artist's own eventual demise, or their experience with the passing of someone close (or distant), it's a theme that spans across all genres and eras of popular music (let alone unpopular music). The Notorious B.I.G. made his debut with an album titled Ready to Die. The Smiths made dying next to your lover sound like the most romantic thing a couple can experience, short of a honeymoon (on which you die, listening to The Smiths). Funkadelic taught us what a maggot-filled skull would sound like if it was a guitar solo. Society and pop culture have an aversion to serious considerations of death—and for good reason—but let's never forget the incredible music it's inspired. 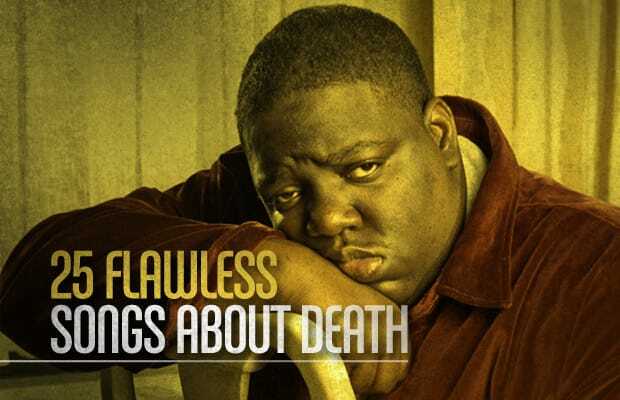 These are 25 Flawless Songs About Death. They are, quite simply, to die for.